Missed the sale today? Stop by the store tomorrow to receive Bowfest 2013 discounts from 10am to 3pm, in-store only. Last chance to get great deals on all your hunting and target archery supplies. Dan Dumas, Talking Sticks expert, wowed the crowd with his turkey call demonstration. Bowfest 2013 Raffle Drawings at 5pm! All proceeds from the raffle will go to the Holly VFW. Help us support American Heroes, and maybe win a prize, too! Join us at 4:15 pm today at Bowfest for a FREE Turkey Hunting Seminar, presented by Talkin’ Stick expert Dan Dumas. The seminar is scheduled from 4:15pm until 5:00pm, at which point the raffle drawings are going to start. If you don’t have your raffle tickets yet, be sure to pick some up! All proceeds from the raffle go to benefit the Holly VFW. Come join in the fun at Bowfest 2013! The Holly VFW is offering delicious pulled pork sandwiches for $4, served with chips and Barlows Sauce. Enjoy your sandwich under the tent while local band Side Track Silhouette sets the stage. Bowfest 2013 has officially started! Join us today from 10am until 6pm for great sales, fun activities, live music, food & entertainment, and much more! We are running one-day specials with prices so low we had to get special one-day permission from our manufacturers to offer you these deals! FOX 103.9 will be broadcasting LIVE from Bowfest between 2pm and 4pm. Commemorative Bucks of Michigan will be at Bowfest – bring your buck with you to get an official score. Side Track Silhouette will be playing LIVE at Bowfest! The Holly VFW will be hosting a Pig Roast, featuring Barlows Sauce! RAFFLE TO BENEFIT HOLLY VFW! There will be a raffle (all proceeds going to the Holly VFW) – enter to win a Hoyt Charger Package, Remington 870, a CVA Muzzle Loader, and more! Have your bow blessed for a successful hunting season! Preview of Bowfest 2013 Special Offers! Here is a sneak preview of the sales and special offers we will be offering at Bowfest 2013 today! We had to get special one-day approval from our manufacturers to sell these items at these discounts, so don’t miss out on these great deals! Join Our Mailing List for Preview of Bowfest Sales! 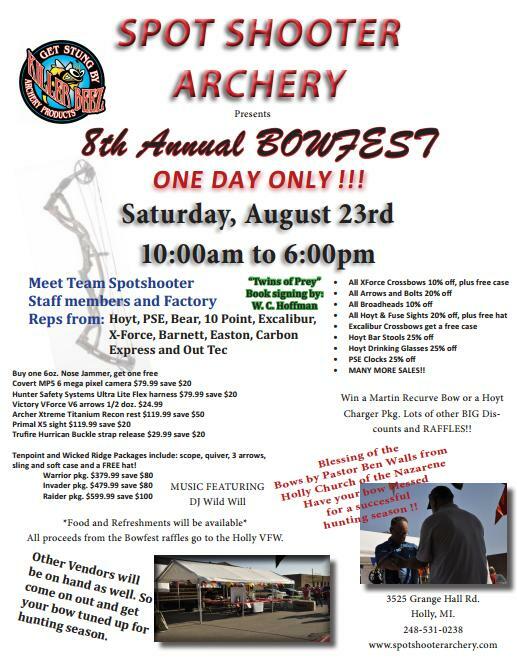 Join the Spot Shooter Archery email list, and get a sneak preview of the sales we are offering at Bowfest this Saturday! We had to get special one-day permission from our manufacturers to offer these deals, so don’t miss out on this special pricing! Join us for our 7th Annual Bowfest! Meet Team Spot Shooter, our amazing staff members, and representatives from some of our biggest brands – including Hoyt, PSE, Bear, 10 Point, Excalibur, X-Force, Barnett, Easton, Carbon Express, G5, and Out Tec! Come on out and get your bow tuned up for hunting season! We are running one-day specials with prices so low we had to get special one-day permission from our manufacturers to offer you these deals! Get a sneak preview of event-day specials by joining our mailing list! FOX 103.9 will be broadcasting LIVE from Bowfest on Saturday, August 24th between 2pm and 4pm. We hope to see you there! This annual event is a great way to start up the season – join us for fun, food, and amazing deals! We will be sending a sneak preview of the event’s sales & specials to our email mailing list – join our valued customers and friends, and subscribe today!